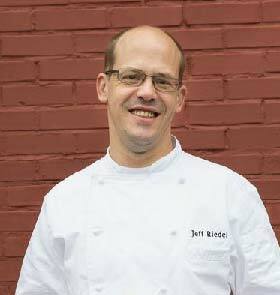 Jeff Riedel brings 30 years of experience in the restaurant and hospitality industry to his position of Executive Chef at 103 West. For more than half of his career he has worked for Buckhead Life. A Chicago native, Jeff started his career in a small Italian restaurant which sparked his interest in the culinary arts. After graduating from Joliet Junior College with his Associates Degree in 1986, Jeff worked for Marriot International as a Culinary Trainee, and later Food Production Manager for 10 years. He joined Buckhead Life Restaurant Group as a line cook and was ultimately promoted to his current position in 1999. Throughout his career in the restaurant industry, Jeff has truly developed his passion for food and attention to detail. His favorite foods to prepare and eat are classic French cuisine and European dishes. Jeff is passionate about charcuterie, a specialization in smoked meats and seafood entrees. When he’s not in the kitchen Jeff enjoys mushroom foraging, which allows him to add flavorful variety to his dishes.